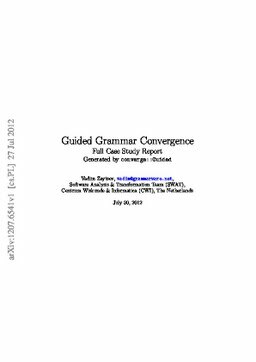 This report is meant to be used as auxiliary material for the guided grammar convergence technique proposed earlier as problem-specific improvement in the topic of convergence of grammars. It contains a narrated MegaL megamodel, as well as full results of the guided grammar convergence experiment on the Factorial Language, with details about each grammar source packaged in a readable form. All formulae used within this document, are generated automatically by the convergence infrastructure in order to avoid any mistakes. The generator source code and the source of the introduction text can be found publicly available in the Software Language Processing Suite repository.